You are at:Home»Gator Navy»Got pirates? The latest hijacking an American couple aboard their yacht Quest by Somali pirates is capturing more of the public’s attention than have dozens of other acts of piracy on the high seas, notably off east Africa where pirates are finding gold in the ransoms sought for their captured vessels ranging from large container ships to smaller craft. Pirates, it seems, face pretty good odds as they wait out for the big payday. Once in awhile, pirates are plain overwhelmed, by firepower or manpower or just will to fight. We saw that when Navy SEAL snipers aboard the destroyer Bainbridge killed all but one of the hijackers who dared to grab the U.S. merchant ship Maersk Alabama and its captain in 2009 – the survivor last week was sentenced to 33 years in federal prison – and last September when a raid force with 15th Marine Expeditionary Unit assaulted the German-flagged cargo ship Magellan Star and captured nine Somali pirates. Other cases get less press, such as last year when the destroyer Farragut nabbed eight pirates suspected in an attempted hijacking of a Tanzanian ship. Just two weeks ago, crews aboard two Navy warships, the destroyer Momsen and cruiser Bunker Hill, blasted a pair of skiffs carrying pirates who tried to hijack the Panamania-flagged vessel Duqm. Still, these incidents are few compared to the increasing number of hijackings on the high seas that threaten the free flow of commerce across the globe and have prompted international task forces to prevent and thwart hijackings. As of mid-February, pirates were holding for ransom 685 sailors from 30 vessels hijacked off the Somali coast, according to the United Nations’ International Maritime Organization, which warned the situation “has progressively worsened” over the past year as hijackings have become more violent. So it’s little wonder why counter-piracy missions, including ship takedowns, have taken on a bit more gravity and somewhat greater focus as sailors and Marines continue to train and prepare for maritime interdiction missions, many which are so-called “compliant” boards – manifest, please? – at the lower end of the conflict spectrum. But the risk of a fight remains a possibility as pirates, drug-runners and human smugglers crisscross the seas in search of some easy money or fame. It’s why senior commanders and seagoing expeditionary forces are rethinking and reshaping the tip of the spear. To stay sharp, ships and units train for potential non-compliant boardings and ship takedowns better known as VBSS – or visit, board, search and seize – missions. 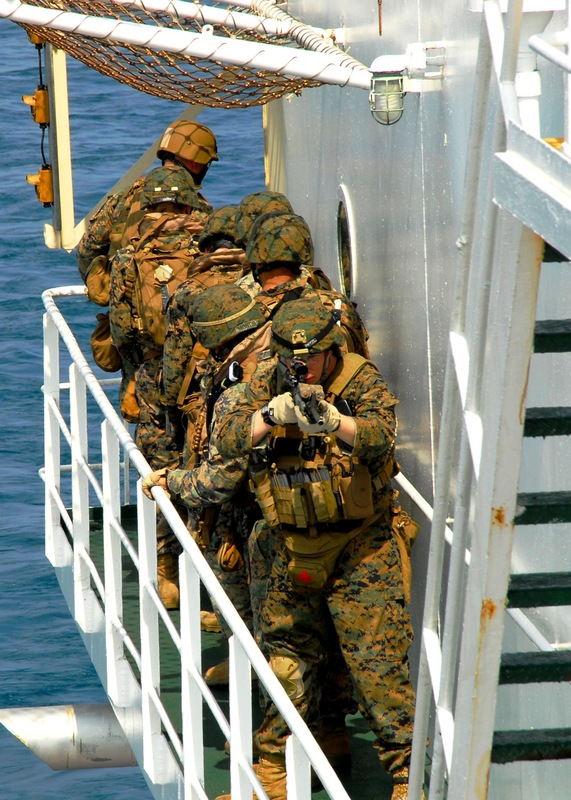 Just this month, a group of Force Reconnaissance Marines with the Japan-based 31st Marine Expeditionary Unit did this month supported by sailors and ships with Essex Amphibious Ready Group during “Cobra Gold” exercises. With snipers aloft on a Navy SH-60 Seahawk helicopter and another warship shouldering the “captured” vessel, the maritime raid force slid down from helicopters and assaulted the combat cargo ship 1st Lt. Jack Lummus in the mock exercise. With Americans now at the pointy end of the hijackers’ weapons, will U.S. sailors and Marines get the call from higher-ups to respond in this latest assault? And will there be a quick resolution? Stand by. 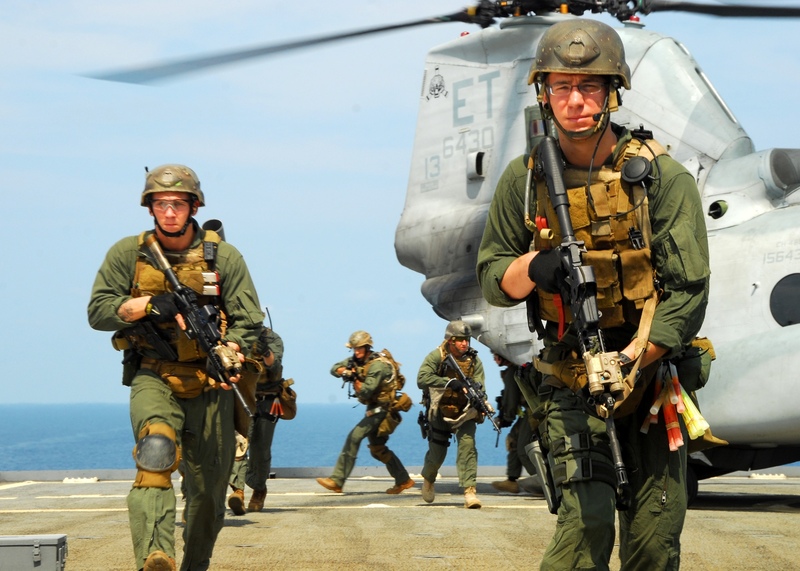 The 13th MEU commander last year told a San Diego defense conference the “answer is perfectly simple: Kill the pirates,” although Col. David Coffman and other panelists at the conference agreed that such extreme missions would likely be driven by political will.